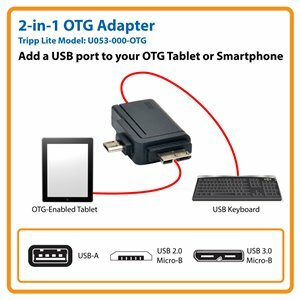 Tripp Lite U053-000-OTG 2-in-1 USB OTG Adapter is the perfect solution for expanding the capabilities of an OTG enabled SmartPhone, Tablet, or other OTG devices, by directly connecting to USB peripherals, such as a USB thumb drive or a USB keyboard and mouse. Add a USB hub to the adapter to create additional ports to connect multiple USB devices. USB OTG technology makes this connection easy, and does not require drivers or software...Plug-n-Play! It features multiple connectors, so you can connect to OTG enabled devices with either a USB 2.0 Micro-B or USB 3.0 Micro-B port, and then connect the USB device directly to the USB A port on the adapter for immediate use. Expand the capabilities of your OTG-enabled tablet, smartphone or other OTG device with Tripp Lite’s 2-in-1 OTG Adapter. The U053-000-OTG adds a USB-A port to your OTG device so it can act as a USB OTG host. This allows you to connect your device to a USB peripheral, such as a flash drive, keyboard or mouse. Or, you can add a USB hub to your device, creating multiple USB ports for multiple devices. This adapter is perfect for use at home, the office or anywhere you need OTG capability. For ultimate compatibility with your different OTG devices, the U053-000-OTG has two male connectors: a USB 2.0 Micro-B and a USB 3.0 Micro-B. Now you can use the same adapter with different OTG devices. And, as you replace devices, you’ll have an adapter with both types of Micro-B connectors. For peace of mind, the U053-000-OTG comes backed by a lifetime warranty. It’s manufactured in compliance with strict RoHS specifications, reflecting Tripp Lite’s commitment to environmental responsibility.